Stephen Mulliner discovered "serious" croquet as an undergraduate at Emmanuel College, Cambridge in 1975. An early opportunity to see Keith Wylie in action and the discovery that croquet had an international dimension in the form of the MacRobertson Shield contest cemented his interest and ensured that croquet would displace golf and become his principal competitive recreation. He confirmed his place at the top level of the game by winning the President's Cup for the first time in 1981 and enjoyed a decade-long rivalry with Nigel Aspinall until the late 1980's which saw the arrivial on the scene of a new generation of first-class players. For over twenty years, Stephen has remained in contention with the younger stars and shows no sign of losing his competitive edge, culminating in victory in the 2016 Association Croquet World Championship in West Palm Beach, Florida at the age of 62. In 2000, he began to compete in the British Open Golf Croquet Championship and now plays both AC and GC with equal enthusiasm. Stephen has travelled widely in pursuit of international competitition and won the first three of the Sonoma-Cutrer championships in 1986 to 1988. 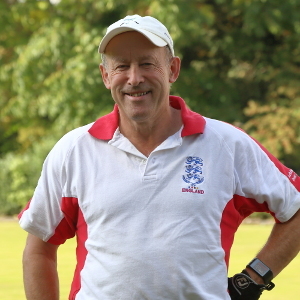 He achieved his goal of representing Great Britain in 1982 when GB regained the MacRobertson Shield in Australia and has since appeared on seven further occasions. He is, so far, the only player to have won the singles and doubles AC championships of Australia, England, New Zealand and the USA. He has also won AC or GC national championships in Austria, Germany, Ireland, Japan, Spain and Switzerland and has won numerous European Championships in both codes. He has also competed in Egypt, France, Italy, Scotland, South Africa and Sweden. Shortly after Stephen became a presence on the tournament circuit in the late 1970s, he began to develop a grading system for croquet players that was based on the Elo System used for chess. The system gradually became an established service to the playing community and grading lists were published annually in the Croquet Gazette. Stephen single-handedly maintained the AC grading system until the mid-1990s when Chris Williams offered to help and handed over responsibility completely in 1997. In 2007, he took over the GC grading system from Bill Arliss and has maintained it ever since. Stephen joined the CA Council in 1980 and quickly became an active and vocal contributor, serving as chairman of several committees, as Sponsorship Officer for several years and then as Chairman of Council from 1990 to 1992. With Nigel Aspinall, he was responsible for the introduction of seeding in major events and, to meet rising demand, the extension of the Open Championship from its traditional six day format to the today's nine day format. He was elected a Vice-President of the CA in 2001. A lawyer by training, Stephen has always had a keen interest in the AC Laws and GC Rules. He played a major role in the production of the 6th Edition in 2000 and was the original author of ORLC (the Official Rulings on the Laws of Croquet). He was appointed as the CA representive on the WCF Golf Croquet Rules Committee in 2017 and served as Editor of the 5th Edition of the WCF Rules of Golf Croquet which were approved by the WCF Council in July 2018. His administative interests became international when he was elected President of the European Croquet Federation in 1998 and were further extended when he was elected to the World Croquet Federation Management Committee in 2009. He became the Secretary-General of the WCF in 2013 and was re-appointed for a further four-year term in 2017. Stephen has always found great enjoyment in playing, supporting and administering both codes of the game. A wonderful temperament, good sportsmanship and excellent demeanor have made him the perfect ambassador for the sport of croquet.